. 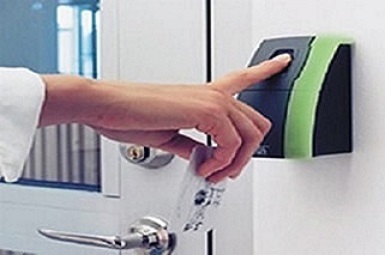 :Access Control Systems integration and installation in Lagos, Nigeria:. From homes to factories and offices of any size, our intrusion systems meet the most rigorous international standards and include the most advanced security technology. Typical products and systems include intrusion detectors/alarms, transmission equipment plus Local Security Network (LSN-Bus) equipment. We help organisations make sure they are not leaving themselves exposed to unnecessary and excessive business risk as well as the inevitable financial pitfalls. something you are, typically a biometric input. 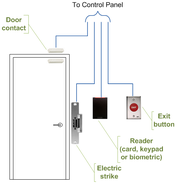 "Home run" (typical) configuration: non-intelligent readers that simply read card data are used, all components connect directly to a control panel. Advantages: since the interface between a control panel and a reader is standard, almost any type of reader may be used regardless of the identification technology or manufacturer. Disadvantages: generally there is more cabling to be done and the closet or cabinet containing the control panel may become jammed with cables coming from multiple doors; in case a control panel fails, all doors connected to that panel will be affected. Distributed configuration: intelligent readers are used, all components connect directly to a reader. Advantages: there is less cabling work, maintenance and troubleshooting tasks are usually simpler; in case an intelligent reader fails, the problem is limited to just one door controlled by that reader. 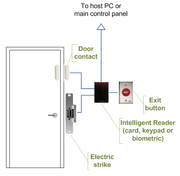 Disadvantages: Intelligent readers are usually bigger and more space is required behind the reader for connecting door hardware components; selection of intelligent readers is not as wide as selection of non-intelligent ones. 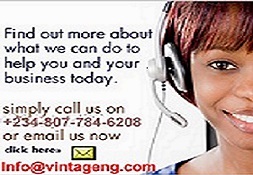 We use Vintage Technologies for the maintenance and support of our own Access control systems. Whenever I need any help or support they are always there to assist and fix any problems. Vintage Technologies are always there for us.